Rotrex Superchargers Based in Copenhagen, Denmark. Their web site is now new and improved and has quite a lot of information on the range of units available. They are also very helpful on the telephone and email. Metal Stuff by Safire Specialised metalwork, talk to Adrian. Adrian has produced many parts for the lightweight over the last couple of years from Engine mounts through to the Stainless steel Hinges as seen on the doors and Bonnet. RPI Engineering Suppliers of all parts related to the Rover V8, they seem to have a biased view on supercharging, quoting many poorly designed or implemented systems and the problems associated. However they have lots of stock and are quite friendly and helpful when trying to find parts. Power Engineering One of the best performance Tuning companies around. They have both two and Four wheel Rolling roads, the ONLY real way to tune an engine correctly. Causeway 4x4 Centre based down in Woolavington, Somerset, they have many Land Rover parts priced at far less than the main dealers. They are also friendly and helpful. I bought the gearbox and Transfer box from them, both brand new still in their crates. Hunters (Southampton) Land Rover The main dealer that I have spent far too much money at over the years, I am on first name terms with the chaps in the parts department, they are all helpful and friendly. Mech Repairs Another performance tuning company with Rolling road capabilities, they also provide Injector cleaning and flow matching/balancing, they cleaned and flow matched all of my injectors to within 2% prior to fitting. Ultraleds Company supplying replacement LED bulbs. They seem to do most if not all of their business over the web. I have ordered a number of replacement dashboard bulbs from them. Their service is very good and received my order within a couple of days of placing it. John Craddock Ltd Specialist Land Rover parts, Have a good web site that allows you to search for components based on vehicle type year etc. AP Racing Suppliers of up-rated Clutches and Braking systems. They don't tend to sell directly, but are very helpful with advise on specific applications and have a good dealer network. Demon Tweeks Certainly not the cheapest place, but they make up for it with their stock and availability. I have bought many items from them over the years, including recently the new Momo seats. SPA Design Manufacturers of various automotive items including their excellent range of Dual Gauges of which I have the Boost/Fuel Pressure, you can also buy them all online. Wrington Engineering Specially designed and manufactured stainless wheel nuts to your requirements. MSD Ignition High Performance ignition systems from the USA, you can now get them from Various suppliers in the UK. Yokohama Tyres High performance Tyres for both on and off road use. Merlin Motorsport Good prices and usually good stock, Especially handy for things like Samco Sport Silicone hoses and BF Goodridge Brake hoses. RS Components (Radio Spares) in my day, excellent supplier of electrical and electronic components and a lot more too. You cant buy from their trade counters unless you are a registered company but you can order directly via their web site, and they usually deliver next day. Pace Products are one of the leading manufacturing companies in the motor racing world, specialising in dry sump equipment, aluminium water radiators and intercoolers, and associated parts and accessories. RacksDirect.co.uk Land Rover Expedition Roof Rack Systems supplied to your door, direct from the factory. Guys 550 Spyder My Friend Guy's site detailing the build and development of his Technic 550 Spyder, a Replica Porsche 550 Spyder. Porsche 914 - Chevy V8 Powered Very cool Car, twin supercharged Chevy V8 Powered 914, unfortunately not on the road at the moment but hopefully will be soon. I think Julian the owner is currently looking for some larger Superchargers. CJ's Ultima GTR Site Probably one of the best and most informative car build sites on the web, plus its a very nice ride. Andy Saunders Kustoms Andy Lives in the Bournemouth area and tends to take some of his creations down to CCOTP. He has had many of his cars featured in both print and on TV. Some of the more wacky motors include the 1958 X-2000 futuristic concept replica and the Mentley Insanne, a cross between a Bentley Melsanne and a Range Rover! 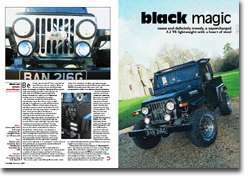 Land Rover Owner International Land Rover Owner featured my Lightweight in the April 2004 Issue, We took the pictures for the feature in the New Forest. There is quite a good under bonnet photo that they marked up with most of the non standard items for clarity. Click the picture to read the article. Supercharged! Probably the best book out there with everything you ever wanted/needed to know about superchargers and supercharging. It is full of pictures and useful formulas for working out what you need it has 346 pages, 165 photos, illustrations and diagrams. I can not overstate how useful this book is to anyone considering embarking on a supercharger project. Click on the book cover to go to the publishers site to learn more. The Rover V8 Engine. The aluminium Rover V8 high performance engine has been in continuous mass production for 25 years, following an inauspicious start in life. It was rejected by its original American creators in the early 1960s, but the rights to manufacture were taken up by Rover in 1965 and it is now expected that production will continue until the end of this century. Since being adopted by Rover, the V8 has been used in a diverse range of vehicles, from the Rover 3500, the Land Rover and Range Rover, the MGB GT V8, a number of high performance specialist sports cars, and many others. it has also had a successful competition career in rallies with the Triumph TR7 V8 and in saloon car racing with the Rover 3500 SD1. This is the story of how this versatile engine crossed the Atlantic and found success, together with a thorough technical assessment and details of tuning for increased power output. Tuning Rover V8 Engines. Based on the Buick-Oldsmobile, the aluminium Rover V8 high performance engine has been a favourite of professional racers and amateur enthusiasts for over 20 years. 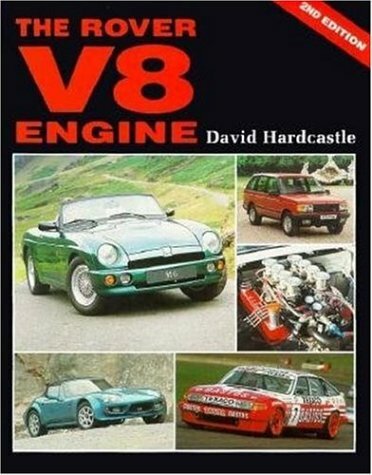 This book assumes only basic knowledge of engine assembly, but reveals tips and secrets used by the professionals. Includes every aspect of assembly, from selecting components to increasing engine capacity. Covers road cars, off-road vehicles, circuit racing and rallying. Photographs illustrate every aspect of building and tuning.